The GoMic by Samson (SamsON, not SamsUNG) is a cost-effective solution to recording high-quality audio in a very small and portable package. It’s available for just $33.32 on Amazon, which is a great price when you consider the great audio quality that you get in a microphone that can fit inside of your pocket. 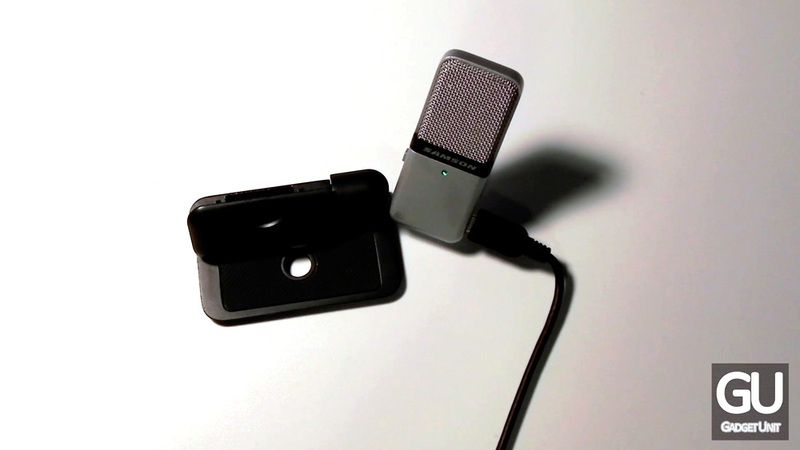 As mentioned a number of times already, the microphone is extremely small, making it perfect for recording on-the-go. Permanently fixed to the microphone is a very well-built and strong metal clip with some strips of rubber to keep whatever it’s clamped to from getting scratched. Also on the clamp are four rubber feet as well as a hold so that you can attach it to a microphone stand or a stand of some sort. On the microphone, you’ll find a 3.5mm audio output for live, real-time input monitoring, the mini USB port, as well as a switch that allows you to switch between three different audio modes, as outline below. Lastly, on the front below the Samson logo, there’s a small LED. When the microphone is powered, it will be lit green. Its only other color is red, which you’ll only see if your recording is too loud, which will result in clipping. Cardioid -10 dB – Uses the cardioid setting, but decreases volume by 10dB. Using the microphone is simple, as it’s a simple plug-and-play USB input on your computer, meaning you can use any audio software to record the microphone. In general, the audio quality is quite superb, again, considering the size and cost of the GoMic itself. One cannot simply describe audio, so you can hear what the microphone sounds like by listening to the review video below, of which the GoMic was used for the entire audio track. All told, this microphone is a no-brainer purchase for those who are on a budget or simply don’t want to spend a high amount of money for a simple microphone to take care of their audio recording needs.